Just how long interim funding will play a central role in responding to water issues depends on implementing long-term solutions to contamination and groundwater depletion. Gov. Jerry Brown declared the end of California’s five-year drought in April 2017 after a wet winter replenished shrinking reservoirs. But the lingering impact of the drought, especially on groundwater supplies, means some still rely on emergency water tanks while they wait for long-term solutions. With the help of emergency funding requested by Assembly member Joaquin Arambula (D-Kingsberg), whose largely rural district is in the valley, the emergency water supply program will likely continue another year at a cost of $3.5 million. Also included in the emergency relief efforts is $10 million to address failing domestic wells and septic tanks, and $10 million for the Drinking Water for Schools Program that funds treatment solutions for schools that struggle with contamination. New state regulations for contaminants like lead and carcinogen 1,2,3-trichloropropanemean schools will need more money to meet safe drinking water standards. “There are parts of my community that lack access to the basic necessities for life,” said Arambula. He said he frequently encountered patients without access to clean water in his work as an emergency room doctor in the Fresno County city of Selma. The Senate and Assembly budget committees approved the request and it’s now part of final budget negotiations. As with other line items, the Legislature could still vote to remove the requested money from the budget package before it is finalized. The money partially bridges a gap in critical services for a group of California residents who lack access to clean water. November analysis by PPIC Water Center estimated about 500,000 people in the state get their water from a system not compliant with safe drinking water standards. That number does not include people who rely on domestic wells. But the need this funding addresses won’t disappear entirely by the middle of 2019 when the next budget year starts and that’s because many of the problems are related to groundwater overdraft. The state now has more than 20 groundwater basins that are deemed “critically overdrafted.” The San Joaquin Valley is particularly hard-hit and many communities there are entirely reliant on groundwater. As farmers dug deeper wells to keep up with a falling aquifer during the drought, many shallower domestic and community wells were left high and dry. 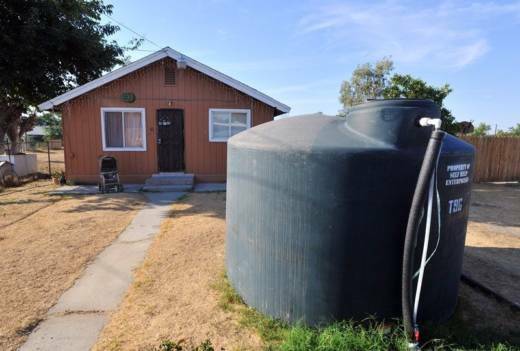 During the drought, the state started providing tanks for free to residents who rely on domestic wells that ran dry. A water truck comes at regular intervals to the residents’ properties to fill the receptacles at no cost. Nonprofits like Self-Help, as well as some counties, administer the tank program and distribute state-funded loans and grants to drill new wells. “I think we’ll be able to really end the tank program this coming year, barring some other extreme circumstance,” said Self-Help community development manager Jessi Snyder. But she said the need for new wells will continue in coming years. More applications for help are coming in, Snyder said; hundreds who have requested applications have not completed and returned them yet. Still, the pace of work has slowed down. At the peak of the drought in 2015, Self-Help was seeing around 15–20 requests per week, said Self-Help program director Susan Long. That number has gone down to 10 a month but there is still a backlog. “You just couldn’t get a well driller to respond at the height of the drought,” said Snyder. Some in the organization’s service area who have not sought help may also be in precarious situations, with wells that may be close to running dry. There’s a long-term solution that should mitigate the drying up of wells. Groundwater management plans implemented as part of the rollout of the Sustainable Groundwater Management Act are intended to prevent excessive pumping of groundwater. But the law, passed in 2014, doesn’t require plans to be in place until 2020, and then it will take years for it to start tangibly impacting groundwater levels. “We’ve taken decades to get into this situation, and it’s going to take us a couple decades to get out of it, I think,” said Snyder. In the interim the state is also pushing consolidation, where those with failed wells or unsafe septic systems are connected to nearby systems in working order. Residents living close enough to larger water or sewage systems may feasibly be able to connect to them, and the funding Arambula has requested can also help with that. A University of California, Davis study found that two-thirds of residents in disadvantaged San Joaquin Valley communities without safe drinking water lived within a mile of a system meeting clean water requirements. Two bills, Assembly Bill 2501 and Senate Bill 1215, would explicitly expand the state’s authority to force absorption of domestic wells and septic tanks into nearby larger systems that function properly. A law already passed, Assembly Bill 88, allows the state to step in and mandate consolidation of community water systems under some circumstances. The idea is to extend the benefits of larger systems’ economies of scale to areas with smaller systems that lack resources and often have little hope of building those systems up given small ratepayer bases. If the new bills don’t pass, there will be no guarantee that people who rely on their own private drinking water and septic systems have a chance of connecting to larger, higher-quality systems. Then there’s the cost. Jennifer Clary, a water policy and legislative analyst for the environmental advocacy group Clean Water Action, said a single new connection to an existing drinking water system could cost between $5,000 and $10,000 depending on how much infrastructure it requires. Connecting an entire community of domestic well users would be more expensive. The $10 million requested for dealing with dry wells and failing septic systems “would be helpful, but would not make an appreciable dent in the backlog of projects,” said Clary. That’s why Clary, Seaton and others working on water justice issues in California have pushed a long-term funding mechanism. The Safe and Affordable Drinking Water Fund would create a dedicated supply of around $140 million, annually, for a broad range of water quality efforts including not only treatment of water in schools and consolidation but also ongoing costs of treatment for struggling water systems too remote to consolidate. The fund is included in Governor Jerry Brown’s budget as a trailer bill, and may undergo changes before the final budget faces a vote. If the trailer bill passes in the budget as proposed, it will still take time for the fund to accumulate. That means the money wouldn’t be immediately available, said Snyder. Which means emergency water needs could still require short-term funding solutions, such as those in Arambula’s request. “I believe we need temporary relief until we can get to a long-term solution, and we’ll continue to figure out how we can get to those longer-term solutions,” said Arambula.